Miguel Almiron was a key performer for Rafael Benitez's side today. 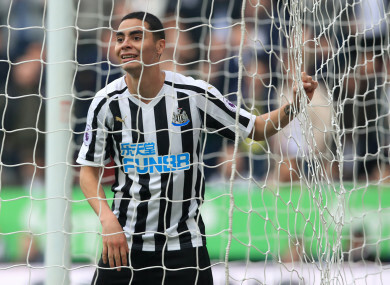 MIGUEL ALMIRON STARRED on his full debut as Newcastle United moved four points clear of the Premier League relegation zone with a dominant 2-0 win over 10-man Huddersfield Town on Saturday. After losing only one of their previous four league games, Newcastle were always favourites for victory against the division’s bottom club, and their hopes were boosted by a first half in which they hit the post twice and Huddersfield’s Tommy Smith was sent off. Huddersfield clung on to reach the interval on level terms despite Smith’s poor challenge on record signing Almiron, whose excellent performance was eventually rewarded as Newcastle cruised to victory in the second half. Salomon Rondon broke the deadlock in the first minute of the second half and Ayoze Perez quickly made it 2-0, moving Newcastle up to 14th. Huddersfield remain 14 points adrift of safety and appear certain to be relegated. A wonderful counter-attack almost saw Almiron claim a goal early on, his dinked finish over Jonas Lossl striking the left-hand post, which Rondon then rattled on the follow up. Rondon was denied by the brilliant Lossl and the Terriers’ task was made harder when Smith rightly saw red for a rash diving tackle on Almiron. Lossl sprung to his right to keep out a low Almiron strike, but almost gifted him a goal as a tame effort squrimed under the Dane and had to be cleared by Chris Lowe. Perez became the latest to draw a fine save from Lossl before Rondon spurned a gilt-edged chance just before half-time, somehow diverting Sean Longstaff’s superb right-wing cross well wide. However, the dam finally broke 59 seconds into the second half, DeAndre Yedlin controlling Florian Lejeune’s cross-field ball and playing in Perez, who combined with Isaac Hayden to tee up Rondon to fire through Lossl’s legs. Six minutes later the points were effectively sealed as Yedlin and Rondon combined following Almiron’s pass and Perez volleyed into the bottom-left corner. Only the crossbar prevented Newcastle from adding to their lead, Kenedy and Longstaff each striking it in the closing stages. Newcastle make most of favourable fixture While it may be unfair to consider a home game against Huddersfield straightforward given their exploits last season, this is a very different team to the one that stayed up under David Wagner and Newcastle made sure not to fluff their lines with a superb attacking performance. They were relentless after Smith was dismissed and the margin of victory could have been much greater. This was the best Newcastle’s attack has looked all season and new boy Almiron was the key. His range of passing and link-up play injected life into a forward line that looked quicker and more fluid for his presence. The standing ovation he received after being substituted late on was richly deserved. Smith did his best to protest his innocence but he could have no complaints about his red card, which significantly diminished Huddersfield’s hopes of an upset. Newcastle can go beyond 30 points and take a huge step towards survival if they beat Burnley at home on Tuesday. Huddersfield welcome Wolves to West Yorkshire on the same day. Elsewhere, Josh King scored a first-half penalty but missed another late on as Bournemouth and Wolves played out an entertaining 1-1 draw at the Vitality Stadium on Saturday. King gave the Cherries a 14th-minute lead from 12 yards after being brought down by Joao Moutinho, but Wolves pulled level with a spot kick of their own in the 83rd minute, Raul Jimenez slotting home. Referee Roger East then remarkably awarded a third penalty just two minutes later after Ryan Fraser when down softly under Ivan Cavaleiro’s challenge as he entered the area, King this time firing wide from 12 yards. While Eddie Howe’s side will be disappointed not to have taken all three points, they have at least ended a run of two defeats, while Wolves remain in eighth after being leapfrogged by Watford on Friday. Email “Newcastle's record signing stars on full debut as three penalties feature in Bournemouth-Wolves draw”. Feedback on “Newcastle's record signing stars on full debut as three penalties feature in Bournemouth-Wolves draw”.